Summer is flying by. I can’t believe that July has already come & gone as have our first 6 weeks of the market! 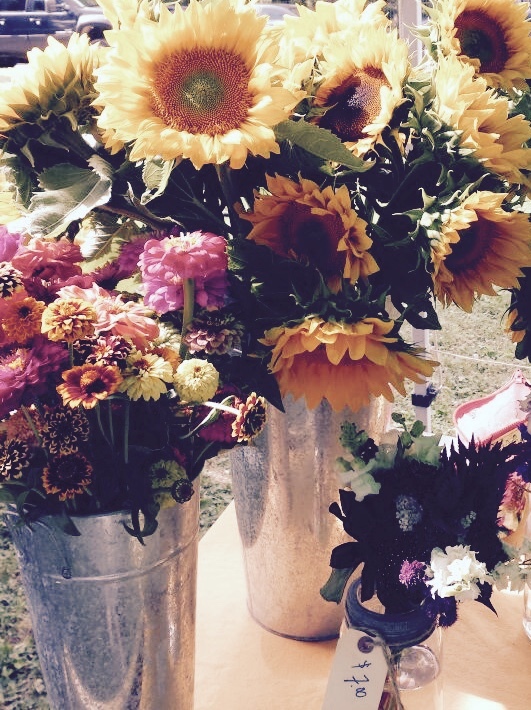 Every week has been a lesson for us new to organizing a farmers’ market (i.e. 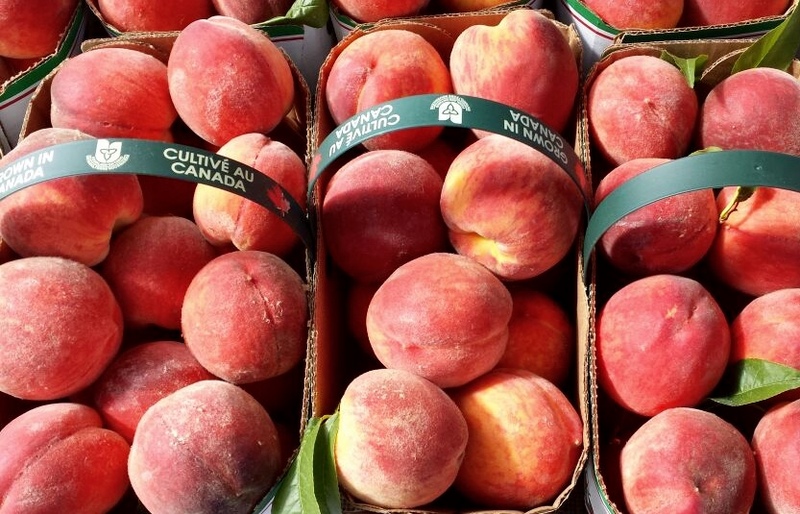 surviving 3/6 market days with rain, calling Prince Edward County – Prince Edward ‘Country’ on a sign, our first visit from the City, learning what vendors people are looking for). Every week we say how blessed we feel that community members, farmers & food artisans all gather in such a beautiful outdoor setting. We want to thank everyone from the community who has continued to come out (rain or shine) and who have offered feedback & gratitude. Without you coming out and helping to spread the word there would be no market. We were also recently visited by Snapd Cabbagetown – who took some beautiful pictures! 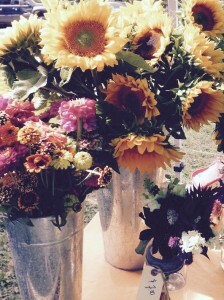 Summer abundance is in full bloom and you will be seeing new produce each week (soon should be tomatoes!) Right now we have great fixings for all types of meals. Both summer squash and patty pan squash, juicy blackberries, wild blueberries & peaches, sweet pickled red beets – as well as candy cane, golden and red beets fresh picked all make for a unique borscht. Savoy cabbages are perfect for cabbage rolls. You can get dried red clovers to steep an iced tea – sweetened with honey from the Bee Shop. Flat Rock Cellars has a great variety of Chardonnay, Pinot Noir & Riesling wines for you! Do you love sun-dried fruits & raw, un-salted nuts? Mervyn from Intaba Mountain has a great variety of delicious fruit dried naturally, with nothing added (no pesticide use, no sugar added). He also has high-quality nuts grown on Fair Trade farms. 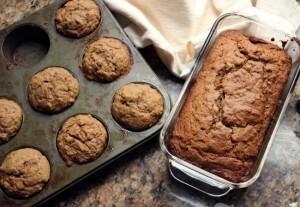 My daughter Jillian found a recipe for banana zucchini muffins on shutterbean.com that incorporates whole wheat flour and flax meal. We tweaked it with the addition of more spices, an extra banana, high-quality chocolate, and coconut sugar and molasses. Note that there is no added oil or butter; the flaxseed takes on the fat role. These muffins are extremely healthful and are guilt-free enough even for breakfast. Makes 12 muffins. Lightly grease a 12-cup muffin tin with coconut oil, non-hydrogenated vegetable shortening or butter; set aside. In a large bowl, whisk together the flour, flaxseed, sugar, baking soda, baking powder, salt, cinnamon and ginger. In a medium bowl, whisk together the egg, milk, molasses (if using), vanilla and banana. Whisk in the zucchini. Pour the liquid ingredients into the bowl with the dry ingredients. Stir until just combined. Gently stir in the pecans (if using) and chocolate (if using). Spoon the batter evenly into the muffin cups. Bake in a 350º F oven until the tops of the muffins are firm to the touch and a toothpick inserted into the centre comes out clean, about 20 to 25 minutes.